Definition at line 53 of file conf.h. Definition at line 699 of file conf.c. Referenced by ActionInitConfig(), ConfNodeIsSequence(), ConfYamlLoadFileWithPrefix(), DetectEngineGetEventInfo(), HtpConfigRestoreBackup(), SCHInfoLoadFromConfig(), and SCRuleVarsGetConfVar(). Definition at line 722 of file conf.c. References ConfNodeFree(), SCLogDebug, and strlcat(). Referenced by ConfNodeIsSequence(), ConfYamlLoadFileWithPrefix(), DetectEngineGetEventInfo(), GlobalsInitPreConfig(), HtpConfigRestoreBackup(), SCHInfoLoadFromConfig(), and SCRuleVarsGetConfVar(). Definition at line 780 of file conf.c. Referenced by DetectEngineCtxFree(), DetectEngineReload(), and main(). This function will return the value for a configuration node based on the full name of the node. It is possible that the value returned could be NULL, this could happen if the requested node does exist but is not a node that contains a value, but contains children ConfNodes instead. name Name of configuration parameter to get. vptr Pointer that will be set to the configuration value parameter. Note that this is just a reference to the actual value, not a copy. 1 will be returned if the name is found, otherwise 0 will be returned. Definition at line 331 of file conf.c. References ConfGetNode(), SCLogDebug, and ConfNode_::val. Referenced by ConfGetDouble(), ConfGetFloat(), ConfGetInt(), ConfigGetLogDirectory(), ConfLoadCompleteIncludePath(), ConfNodeIsSequence(), ConfUnixSocketIsEnable(), ConfYamlLoadFileWithPrefix(), CoredumpLoadConfig(), Daemonize(), DefragInitConfig(), DetectEngineCtxFree(), DetectEngineMultiTenantSetup(), DetectFilemagicRegister(), DetectLoadCompleteSigPath(), DetectUricontentRegister(), FlowInitConfig(), HTPParseMemcap(), IPPairInitConfig(), NFQInitConfig(), OutputJsonRegister(), PatternMatchDefaultMatcher(), PcapFileGlobalInit(), PostRunDeinit(), RegisterAllModules(), RunModeDispatch(), RunModeErfFileAutoFp(), RunModeErfFileSingle(), RunModeFilePcapAutoFp(), RunModeFilePcapSingle(), RunModeIdsAFPAutoFp(), RunModeIdsAFPRegister(), RunModeIdsAFPSingle(), RunModeIdsAFPWorkers(), RunModeIdsNetmapAutoFp(), RunModeIdsNetmapRegister(), RunModeIdsNetmapSingle(), RunModeIdsNetmapWorkers(), RunModeIdsPcapAutoFp(), RunModeIdsPcapRegister(), RunModeIdsPcapSingle(), RunModeIdsPcapWorkers(), RunModeIdsPfringRegister(), SCClassConfDeinit(), SCLogLoadConfig(), SCReferenceConfDeinit(), SCRuleVarsGetConfVar(), SCThresholdConfGlobalFree(), SinglePatternMatchDefaultMatcher(), SRepInit(), SRepLoadFileFromFD(), StatsSetUI64(), and TmqhFlowRegister(). val Pointer to an int that will be set to 1 for true, or 0 for false. 1 will be returned if the name is found and was properly converted to a boolean, otherwise 0 will be returned. Definition at line 517 of file conf.c. Referenced by ConfNodeIsSequence(), DecodeTeredoConfig(), DecodeThreadVarsAlloc(), DetectEngineInspectBufferGeneric(), DetectEngineMultiTenantSetup(), DetectMpmPrepareAppMpms(), DetectMpmSetupAppMpms(), Ja3IsDisabled(), NapatechGetStreamConfig(), NapatechPacketLoopZC(), NapatechStreamThreadInit(), NFQInitConfig(), PcapFileGlobalInit(), PostRunDeinit(), ReceiveAFPThreadInit(), ReceivePfringThreadInit(), RegisterNFSTCPParsers(), RegisterSSLParsers(), RunModeFilePcapSingle(), RunModeInitialize(), RunModeNapatechRegister(), SetupFPAnalyzer(), SigAddressPrepareStage4(), StreamTcpAppLayerIsDisabled(), and StreamTcpInitConfig(). Definition at line 388 of file conf.c. References ConfNodeLookupChild(), SCLogDebug, and ConfNode_::val. Referenced by ConfGetChildValueBool(), ConfGetChildValueInt(), and ConfGetChildValueWithDefault(). Definition at line 530 of file conf.c. Referenced by ConfGetChildValueBoolWithDefault(), PostRunDeinit(), StatsSetUI64(), and Unified2AlertInitCtx(). Definition at line 543 of file conf.c. Referenced by ConfNodeIsSequence(), RunModeIdsAFPRegister(), RunModeIdsNetmapRegister(), RunModeIdsPcapRegister(), and RunModeIdsPfringRegister(). Definition at line 469 of file conf.c. References ConfGetChildValue(), ConfNode_::name, SC_ERR_INVALID_YAML_CONF_ENTRY, and SCLogError. Definition at line 495 of file conf.c. Referenced by ConfNodeIsSequence(), RunModeIdsAFPRegister(), RunModeIdsNflogRegister(), and RunModeIdsPcapRegister(). Definition at line 416 of file conf.c. Referenced by AFPRunModeIsIPS(), ConfNodeIsSequence(), RunModeIdsAFPRegister(), RunModeIdsNetmapRegister(), RunModeIdsPcapRegister(), and RunModeIdsPfringRegister(). Definition at line 402 of file conf.c. val Pointer to an double that will be set the configuration value. 1 will be returned if the name is found and was properly converted to a double, otherwise 0 will be returned. Definition at line 615 of file conf.c. val Pointer to an float that will be set the configuration value. Definition at line 645 of file conf.c. val Pointer to an intmax_t that will be set the configuration value. 1 will be returned if the name is found and was properly converted to an interger, otherwise 0 will be returned. Definition at line 437 of file conf.c. References ConfGet(), SC_ERR_INVALID_YAML_CONF_ENTRY, and SCLogError. 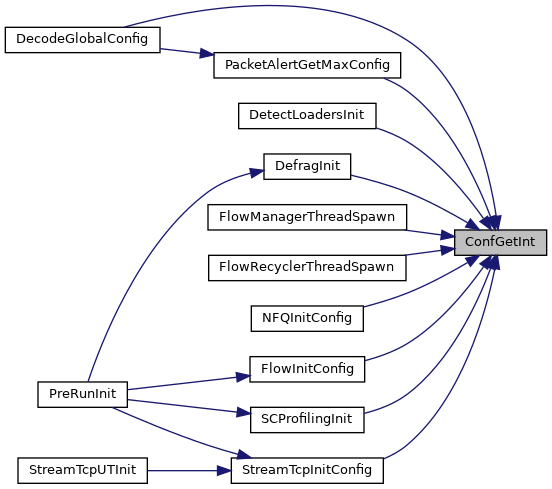 Referenced by ConfNodeIsSequence(), DefragInit(), DefragTrackerFreeFrags(), DetectEngineCtxFree(), DetectLoadersInit(), DetectPcreRegister(), FlowInitConfig(), FlowManagerThreadSpawn(), FlowRecyclerThreadSpawn(), NFQInitConfig(), PcapFileGlobalInit(), PostRunDeinit(), RunModeIdsPcapRegister(), RunModeNapatechRegister(), SCAsn1LoadConfig(), SCProfilingInit(), SigGroupBuild(), and StreamTcpInitConfig(). name The full name of the configuration node to lookup. A pointer to ConfNode is found or NULL if the configuration node does not exist. Definition at line 176 of file conf.c. References ConfNodeLookupChild(), next, NODE_NAME_MAX, SC_ERR_CONF_NAME_TOO_LONG, SCLogError, and strlcpy(). 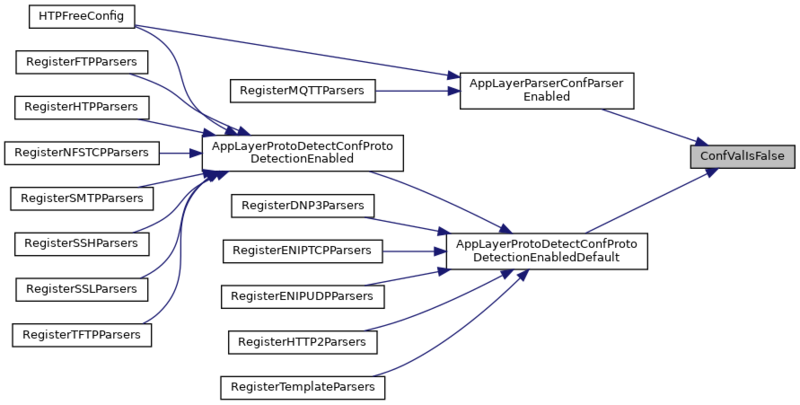 Referenced by ActionInitConfig(), AffinitySetupLoadFromConfig(), AFPRunModeIsIPS(), AppLayerParserConfParserEnabled(), AppLayerProtoDetectConfProtoDetectionEnabled(), AppLayerProtoDetectPPParseConfPorts(), ConfGet(), ConfGetValue(), ConfNodeIsSequence(), ConfRemove(), ConfYamlLoadFileWithPrefix(), DefragPolicyLoadFromConfig(), DetectAddressTestConfVars(), DetectEngineCtxFree(), DetectEngineMultiTenantEnabled(), DetectEngineMultiTenantSetup(), DetectEngineReload(), DetectPortTestConfVars(), DetectTemplateBufferRegister(), DetectTemplateRustBufferRegister(), FlowInitFlowProto(), HtpConfigRestoreBackup(), HTPConfigure(), LiveBuildDeviceListCustom(), NapatechGetStreamConfig(), NapatechSetupTraffic(), OutputRegisterFiledataLogger(), PcapLogProfileSetup(), PostRunDeinit(), RegisterModbusParsers(), RegisterSMBParsers(), RegisterSSLParsers(), RegisterTemplateParsers(), RegisterTemplateRustParsers(), RunModeIdsAFPRegister(), RunModeIdsNetmapRegister(), RunModeIdsNflogRegister(), RunModeIdsPcapRegister(), RunModeIdsPfringRegister(), RunModeInitialize(), RunModeInitializeOutputs(), SCHInfoLoadFromConfig(), SCLogLoadConfig(), SCProfilingInit(), SCProfilingKeywordsGlobalInit(), SCProfilingPrefilterGlobalInit(), SCProfilingRulesGlobalInit(), SCProfilingSghsGlobalInit(), SetupRuleAnalyzer(), SigLoadSignatures(), SRepInit(), StatsSetUI64(), StreamTcpAppLayerIsDisabled(), and StreamTcpInitConfig(). Definition at line 203 of file conf.c. Referenced by ConfYamlLoadFile(), and ConfYamlLoadString(). This function will return the value for a configuration node based on the full name of the node. This function notifies if vptr returns NULL or if name is set to NULL. 0 will be returned if name was not found, 1 will be returned if the name and it's value was found, -1 if the value returns NULL, -2 if name is NULL. Definition at line 360 of file conf.c. References ConfGetNode(), SC_ERR_INVALID_ARGUMENT, SCLogDebug, SCLogError, and ConfNode_::val. Referenced by ConfGetBool(), HostInitConfig(), NapatechSetupNuma(), PostRunDeinit(), and StreamTcpInitConfig(). Definition at line 113 of file conf.c. References ConfNodeNew(), SC_ERR_MEM_ALLOC, SCLogDebug, and SCLogError. Referenced by ActionInitConfig(), ConfNodeIsSequence(), ConfYamlLoadFileWithPrefix(), DetectEngineGetEventInfo(), HtpConfigRestoreBackup(), main(), SCHInfoLoadFromConfig(), and SCRuleVarsGetConfVar(). Definition at line 902 of file conf.c. References ConfGet(), PathIsRelative(), SCLogDebug, SCMalloc, SCStrdup, strlcat(), strlcpy(), and unlikely. node The parent configuration node. name The name of the child node to test. 1 if the child node has a true value, otherwise 0 is returned, even if the child node does not exist. Definition at line 888 of file conf.c. Referenced by HttpXFFGetCfg(), PcapLogProfileSetup(), SCProfilingInit(), SCProfilingKeywordsGlobalInit(), SCProfilingPrefilterGlobalInit(), SCProfilingRulesGlobalInit(), and SCProfilingSghsGlobalInit(). Definition at line 750 of file conf.c. References ConfNodeDump(), ConfNode_::name, next, SCFree, SCStrdup, TAILQ_FOREACH, unlikely, and ConfNode_::val. 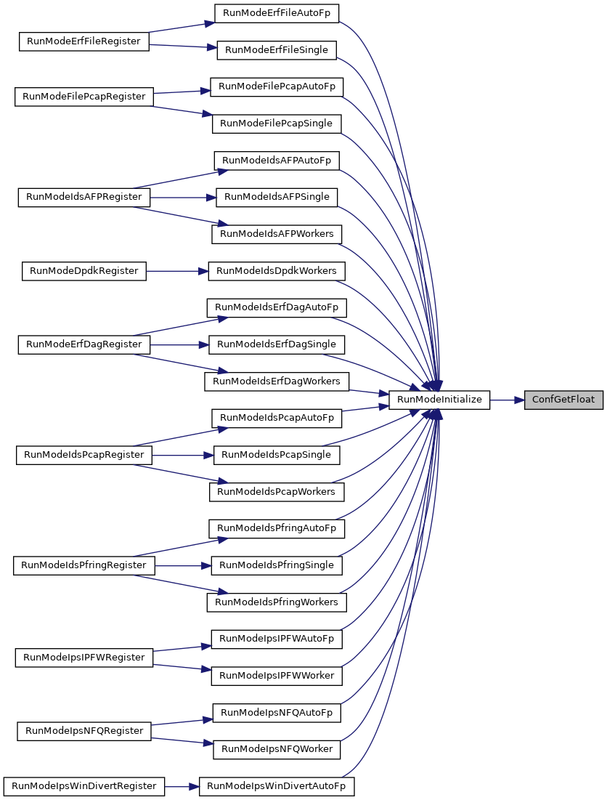 Referenced by ConfDump(), and ConfNodeDump(). node The configuration node to SCFree. Definition at line 152 of file conf.c. References ConfNodeFree(), ConfNode_::name, next, SCFree, TAILQ_FIRST, TAILQ_REMOVE, and ConfNode_::val. Referenced by ConfDeInit(), ConfNodeFree(), ConfNodeIsSequence(), and ConfNodeRemove(). Checks if the provided node has any children. Any node that is a YAML map or array will have children. Definition at line 796 of file conf.c. 1 if node is a seuence, otherwise 0. Definition at line 975 of file conf.c. References ConfCreateContextBackup(), ConfDeInit(), ConfGet(), ConfGetBool(), ConfGetChildValueBoolWithDefault(), ConfGetChildValueIntWithDefault(), ConfGetChildValueWithDefault(), ConfGetInt(), ConfGetNode(), ConfInit(), ConfNodeFree(), ConfNodeHasChildren(), ConfNodeIsSequence(), ConfNodeLookupChild(), ConfNodeLookupChildValue(), ConfNodeNew(), ConfNodePrune(), ConfNodeRemove(), ConfRemove(), ConfRestoreContextBackup(), ConfSet(), ConfSetFinal(), ConfSetFromString(), FAIL_IF, FAIL_IF_NOT, FAIL_IF_NULL, ConfNode_::is_seq, ConfNode_::name, next, ConfNode_::parent, PASS, SCStrdup, TAILQ_INSERT_TAIL, and ConfNode_::val. Referenced by ConfNodeIsSequence(), ConfYamlLoadFileWithPrefix(), and SigLoadSignatures(). Given a ConfNode this function will lookup an immediate child ConfNode by name and return the child ConfNode. name The name of the child node to lookup. A pointer the child ConfNode if found otherwise NULL. Definition at line 815 of file conf.c. References ConfNode_::name, next, and TAILQ_FOREACH. 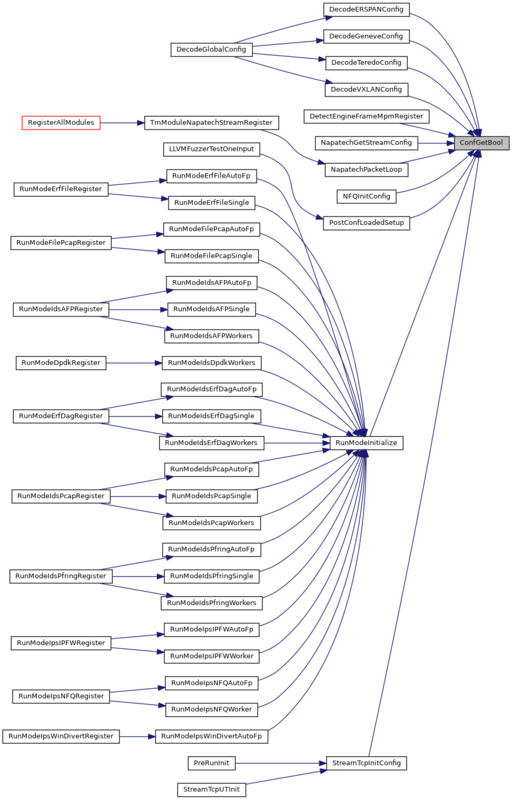 Referenced by AffinitySetupLoadFromConfig(), AppLayerProtoDetectPPParseConfPorts(), ConfGetChildValue(), ConfGetChildWithDefault(), ConfGetNode(), ConfNodeIsSequence(), ConfNodeLookupChildValue(), ConfYamlLoadFileWithPrefix(), DetectEngineCtxFree(), DetectEngineMultiTenantSetup(), DetectEngineReloadTenantBlocking(), FileForceHashParseCfg(), FlowInitFlowProto(), HtpConfigRestoreBackup(), HttpXFFGetCfg(), OutputJsonRegister(), OutputRegisterFiledataLogger(), RunModeInitializeOutputs(), RunModeShutDown(), SCConfLogOpenGeneric(), and SCLogLoadConfig(). Given a parent ConfNode this function will return the value of a child configuration node by name returning a reference to that value. A pointer the child ConfNodes value if found otherwise NULL. Definition at line 843 of file conf.c. Referenced by ConfNodeChildValueIsTrue(), ConfNodeIsSequence(), DetectEngineCtxFree(), FileForceHashParseCfg(), FlowInitFlowProto(), HttpXFFGetCfg(), LogHttpLogInitCtx(), LogStatsLogThreadDeinit(), LogTcpDataLogInitCtx(), OutputJsonRegister(), PcapLogProfileSetup(), RunModeInitializeOutputs(), RunModeShutDown(), SCConfLogOpenGeneric(), SCLogLoadConfig(), SCProfilingInit(), SCProfilingKeywordsGlobalInit(), SCProfilingPrefilterGlobalInit(), SCProfilingRulesGlobalInit(), SCProfilingSghsGlobalInit(), SetupRuleAnalyzer(), StatsSetUI64(), TLSGetIPInformations(), and Unified2AlertInitCtx(). Definition at line 860 of file conf.c. Referenced by AFPRunModeIsIPS(), RunModeIdsNetmapRegister(), and RunModeIdsNflogRegister(). An allocated configuration node on success, NULL on failure. Definition at line 134 of file conf.c. Referenced by ConfInit(), and ConfNodeIsSequence(). Pruning a configuration is similar to freeing, but only fields that may be overridden are, leaving final type parameters. Additional the value of the provided node is also free'd, but the node itself is left. node The configuration node to prune. Definition at line 943 of file conf.c. References ConfNodePrune(), ConfNode_::final, ConfNode_::name, next, SCFree, TAILQ_EMPTY, TAILQ_FIRST, TAILQ_NEXT, TAILQ_REMOVE, and ConfNode_::val. Referenced by ConfNodeIsSequence(), and ConfNodePrune(). Definition at line 668 of file conf.c. References ConfNodeFree(), next, ConfNode_::parent, and TAILQ_REMOVE. Referenced by ConfNodeIsSequence(), ConfRemove(), and DetectEngineCtxFree(). Definition at line 1467 of file conf.c. name The name of the configuration parameter to remove. Returns 1 if the parameter was removed, otherwise 0 is returned most likely indicating the parameter was not set. Definition at line 683 of file conf.c. Definition at line 711 of file conf.c. Configuration values set with this function may be overridden by subsequent calls, or if the value appears multiple times in a configuration file. name The name of the configuration parameter to set. val The value of the configuration parameter. 1 if the value was set otherwise 0. Definition at line 220 of file conf.c. References ConfNode_::final, SCFree, SCStrdup, unlikely, and ConfNode_::val. Referenced by ConfNodeIsSequence(), ConfSetFromString(), ConfYamlLoadFileWithPrefix(), and PostRunDeinit(). A final configuration value is a value that cannot be overridden by the configuration file. Its mainly useful for setting values that are supplied on the command line prior to the configuration file being loaded. However, a subsequent call to this function can override a previously set value. Definition at line 299 of file conf.c. Referenced by ConfigSetLogDirectory(), ConfNodeIsSequence(), ConfSetFromString(), ConfYamlLoadFileWithPrefix(), EngineDone(), PostRunDeinit(), RegisterAllModules(), and RunModeUnixSocketGetDefaultMode(). input the input string to be parsed. 1 if the value of set, otherwise 0. Definition at line 245 of file conf.c. References ConfSet(), ConfSetFinal(), SCFree, SCStrdup, and unlikely. Referenced by ConfNodeIsSequence(), and RegisterAllModules(). The value is considered false if it is a string with the value of 0, no, false or off. The test is not case sensitive, any other value is not false. val The string to test for a false value. 1 If the value is false, 0 if not. Definition at line 591 of file conf.c. Referenced by AppLayerParserConfParserEnabled(), AppLayerProtoDetectConfProtoDetectionEnabled(), HTPFreeConfig(), LogStatsLogThreadDeinit(), OutputJsonRegister(), PcapFileGlobalInit(), RunModeIdsAFPRegister(), RunModeIdsNetmapRegister(), RunModeIdsPcapRegister(), RunModeIdsPfringRegister(), SCConfLogOpenGeneric(), SCLogLoadConfig(), StatsSetUI64(), and Unified2AlertInitCtx(). The value is considered true if it is a string with the value of 1, yes, true or on. The test is not case sensitive, any other value is false. val The string to test for a true value. 1 If the value is true, 0 if not. Definition at line 566 of file conf.c. 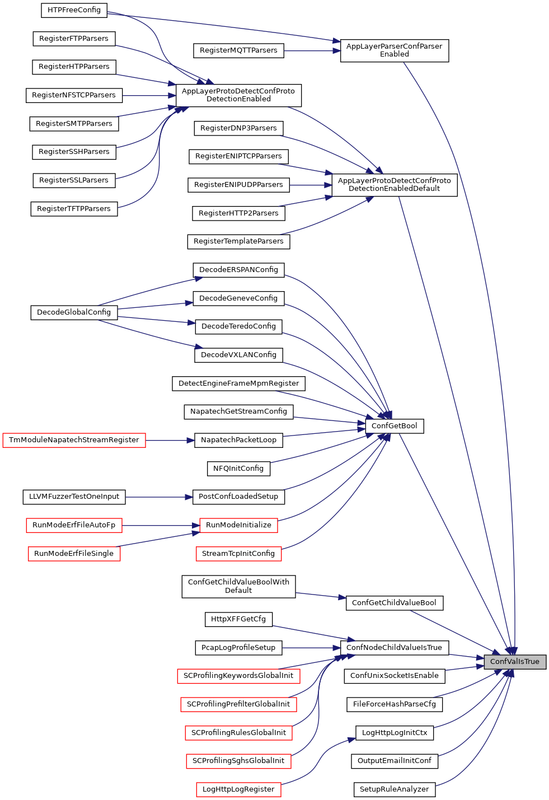 Referenced by AppLayerParserConfParserEnabled(), AppLayerProtoDetectConfProtoDetectionEnabled(), ConfGetBool(), ConfGetChildValueBool(), ConfNodeChildValueIsTrue(), ConfUnixSocketIsEnable(), DefragInitConfig(), FileForceHashParseCfg(), HTPFreeConfig(), LogHttpLogInitCtx(), LogStatsLogThreadDeinit(), OutputJsonRegister(), PcapFileGlobalInit(), PcapLogProfileSetup(), RunModeIdsAFPRegister(), RunModeIdsNetmapRegister(), RunModeIdsPcapRegister(), RunModeIdsPfringRegister(), RunModeInitializeOutputs(), RunModeShutDown(), SCProfilingInit(), SCProfilingKeywordsGlobalInit(), SCProfilingPrefilterGlobalInit(), SCProfilingRulesGlobalInit(), SCProfilingSghsGlobalInit(), SetupRuleAnalyzer(), TLSGetIPInformations(), and Unified2AlertInitCtx().